For more information about this Proven Safety Countermeasure, visit the Office of Safety's Countermeasures that Reduce Crash Severity web page. 1 Fatality Analysis Reporting System (FARS). 2 NCHRP Report 794, Median Cross-Section Design for Rural Divided Highways. Median barriers are longitudinal barriers that separate opposing traffic on a divided highway and are designed to redirect vehicles striking either side of the barrier. 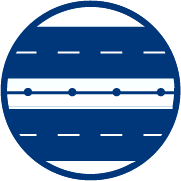 Median barriers significantly reduce the severity of cross-median crashes, which are attributed to the relatively high speeds that are typical on divided highways. Approximately 8 percent of all fatalities on divided highways are due to head-on crashes. In the past, median barriers were typically only used when medians were less than 30 feet wide, but many States realized they were experiencing crossmedian fatal crashes in medians that exceeded 30 feet. AASHTO's Roadside Design Guide was revised in 2006 to encourage consideration of barriers in medians up to 50 feet wide. The application of cable median barriers is a very cost-effective means of reducing the severity of median crossover crashes. Median barriers can be cable, concrete, or beam guardrail. Cable barriers are softer, resulting in less impact force and redirection, are more adaptable to slopes typically found in medians, and can be installed through less invasive construction methods. Concrete barriers are rigid, yielding little to no deflection upon impact, and absorbing little crash energy. Although this system is expensive to install, it performs well when hit and only requires repair in the most extreme circumstances. Beam guardrails are considered semi-rigid barriers. When impacted, they deform and deflect, absorbing some of the crash energy, and usually redirecting the vehicle. 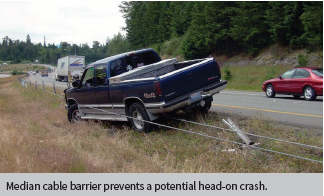 Beam guardrails are less expensive to install than rigid barriers, and are more resilient than cable barriers. To reduce the number and severity of cross-median crashes, transportation agencies should review their median crossover crash history to identify the locations where median barriers are most warranted. Agencies should also consider implementing a systemic median barrier policy based on crossmedian crash risk factors.